Lipton Tea is a British tea company, founded and named after its original owner, Sir Thomas Johnson Lipton. 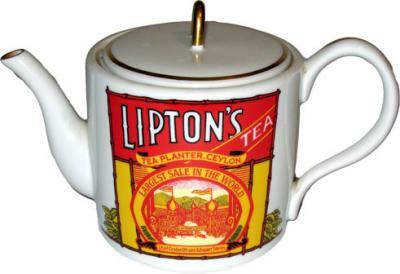 Lipton tea began in 1870 and is currently one of the biggest tea distributors in the world. Lipton was born in 1850, in Glasgow, Scotland. In 1865, Lipton moved to the United States where he held various jobs, including working on a tobacco farm, a rice plantation and a streetcar. Lipton, however, was inspired by working in a department store's grocery. While working there, he witnessed and learned the power of American merchandising. American merchandising was often involved outrageous images or actions, with catchy slogans designed to grab as much attention as possible. Some advertising campaigns were not adverse to publicity stunts. Lipton returned to Scotland and opened his own grocery store in 1871. Following from the lessons learnt in America, he promoted the store by conducting publicity stunts. Lipton's first publicity stunt was a parade of the largest hogs in captivity bearing the sign, "I'm going to Lipton's. The best shop in town for Irish bacon!" This stunt jammed traffic and grabbed headlines - exactly Lipton's intent. By 1880, Lipton had twenty stores, and by 1890, Lipton owned three hundred stores and had become a household name. Lipton did not venture into tea until 1890. On his way to Australia, Lipton made a secret stop to Ceylon. During that year, disease had ruined the coffee plantations, and plantation owners were growing tea instead. Lipton bought five bankrupt plantations to supply his stores in Britain, and used the slogan, "Direct from the Tea Gardens to the Teapot". Lipton intended the public to associate his name with Ceylon tea. Lipton also began to subtly change the meaning of certain tea jargon. For instance, Lipton convinced the public that the term "orange pekoe", a term used to denote the largest leaf size, was in fact a type of tea. His advertisements explained that the term "brisk" simply meant any tea that is not stale. Lipton pioneered the idea of selling tea as individual packets, for longer freshness, consistent quality and guaranteed weight. Lipton tea is now one of the largest tea traders in the world. It is currently owned by the Unilever Company.